Last Christmas, when I got the Christmas money we get from one relative, I decided that I really needed and wanted to buy a chest freezer. The question was, how big and what type of freezer to purchase. We found one that we liked online at Amazon and it was a great price, great size, but the shipping after Christmas was going to take two months because they were sold out. I found one locally that was a close second and a tad smaller and the size is great for our family of 4. I purchased a 5 cubic foot chest freezer. It has one basket at the top and a small shelf on one side. It does not auto defrost, but so far we haven’t had any frost build up on it at all. I have to say that it was the BEST Christmas present EVER for this Mom. 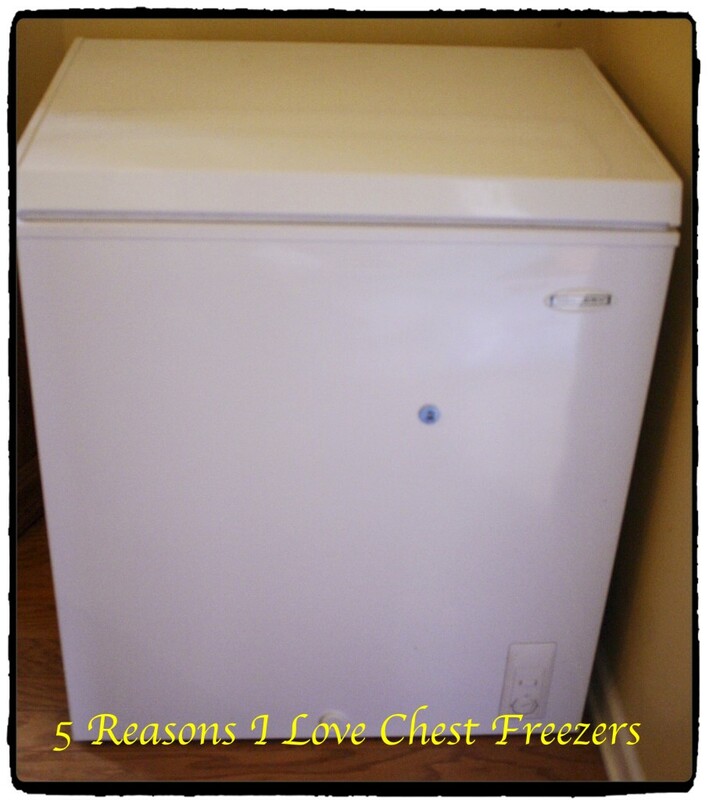 The advantage of having a chest freezer make the cost of it up in your savings in no time. Mine is actually in my dining room since my garage was a total mess and still is. It is convenient and when we have dinners in there, I cover it with a table cloth and use it as an area to place food. Freezer hidden! 1. It saves me a lot of money to be able to stock up on meats by purchasing them at Costco in bulk and then dividing them up in to individual portions. 2. I am able to take advantage of sales on items like frozen steamer vegetables and frozen entrees since I have extra storage room. 3. I was able to freeze tomatoes and other vegetables from the garden to use over the winter and not worry about space in my side by side in the kitchen. 4. It’s a great place to hide Girl Scout cookies! Nothing better than frozen Thin Mints! Plus, it is just really convenient. 5. It allows me to menu plan and grocery shop for an entire month without worrying about storage. I freeze bags of shredded cheese, cream cheese that I use in recipes, butter, even milk. You can not go wrong with deciding to invest in a chest freezer, even if you don’t think you have room, a 5 cubic foot freezer will store a lot of stuff when packed well. It also is great to have meals frozen and ready to go as well as holiday items for those unexpected guest that arrive. The only drawback, things do get lost on the bottom but I have great tips on how to keep your freezer inventoried here!